I have been resisting blogging about our adventures in parenting for a long time. Part of me doesn’t want to keep up with blogging, but part of me does not want my emotional rawness out there forever on the internet. But our little Gracie is so unique — amazing, you might say — that I can’t hold back from sharing her specialness all over the world. We did not plan to get pregnant with Gracie. In fact, we were struggling to be good parents to our son, Jackson, and did not feel ready to have a second child. As sometimes happens, though, we were not as careful as perhaps we could have been. So you see, even her beginnings were a little rocky but full of love. I found out I was pregnant on New Year’s Eve. For a month, Chad had been telling me that he’d gotten me pregnant that one time we weren’t so careful, but I didn’t believe him (even though in retrospect all the signs were there). But on New Year’s Eve, I was coming down the stairs at work, and suddenly I knew he was right. A simple test confirmed it. Did you know that if you’re more than 8 weeks pregnant you don’t have to have a transvaginal ultrasound? It’s true! They can just do it on your tummy like normal. When we went in for that first appointment, I was already 10 weeks pregnant, and Gracie was approximately the size of a lime. She waved in the ultrasound – it was the cutest thing. That was the first of many ultrasounds. We were excited, but nervous about the whole thing. How would we afford another child? Daycare? Diapers? We were barely managing the whole work/daycare thing with Jackson – how could we ever possibly do it with two kids? We had no idea that we were getting into much, much more than the normal parenting-two-kids thing. 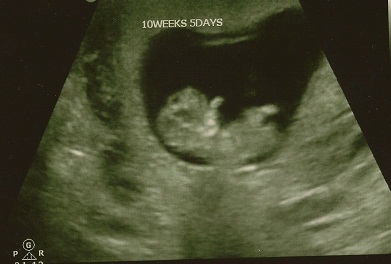 The first time we realized something was wrong was at our 20 week ultrasound. We were so excited to find out we were having a girl that we didn’t really pay attention to what the tech was doing, but when she left to get the doctor we instantly realized something was wrong. The baby’s kidneys were echogenic, which means they were unusually bright on the ultrasound. We were referred to a specialist in maternal-fetal medicine called a neonatologist. We saw the neonatologist every few weeks throughout the rest of the pregnancy. The baby’s kidneys remained “bright” or echogenic until I was about 7 months pregnant. At that time, the kidneys looked normal. We made one more appointment for a month out just to make sure the kidneys were still okay. At that 8 month appointment, the kidneys were still fine, but the baby had turned – she was breech. The neonatologist was very distressed at this. She had looked and looked and could not find anything wrong, but baby being breech is a “classic” symptom that there is something wrong. Looking back, given what we know about Gracie now, it’s really no surprise that she was confusing docs even before she was born. So with a breech baby, you’re pretty much guaranteed to have a c-section, but I was really dead set against that (I had had a drug free childbirth with Jackson and wanted to repeat the experience). My midwife was awesome, and she agreed that since Jackson was so late and I wasn’t showing any signs of imminent labor, we could schedule a version (where they turn the baby in utero in hopes of getting it head-down for the birth) and schedule a c-section for the same day, so that if the version didn’t work they could take me right in for the section. We scheduled all of this for August 25, one day after her due date. As planned, we made our early morning trip to the hospital that bright day in August. We attempted the version, which actually did work – the baby turned – but then she turned right back to where she was before. The doctor told us that he’d never seen a full term baby move as much as she did. At one point, you could actually make out her knuckles raking across the top of my belly. They kept trying to turn her and keep her head-down, but she kept moving back. They tried to hold her in the correct position and then break my water, but that didn’t work because there was no tension on the amniotic sac and it wouldn’t break. The attempt was VERY painful! Anyway, at that point, our midwife gave us two options – she could try to hold the baby’s head down during the labor until suction forced her head into the birth canal, which sounded really unlikely and would most probably end up requiring an emergency c-section, or we could stop trying to force it and allow the baby to be born via c-section. It was a hard and sad decision, but we didn’t want to go through a difficult labor and end up in surgery anyway so we opted to just do the c-section then. The c-section went fine, no problems, and Grace Elizabeth was born at 10:30 a.m. on the nose. She was a beautiful baby – 7 lbs, 12 oz, and 20″ long, with a little bit of hair. She was breathing very loudly, and I remember asking the nurses if she was okay. They thought she needed oxygen and whisked her away to the NICU. Chad followed her and stayed with her while I waited for my toes to wiggle. Finally, after what seemed like hours of recovery, I was allowed to see my baby. They wheeled my bed into the NICU and I saw my sweet tiny baby girl. At that point, she was still breathing very loudly but her pulse ox level was normal, so they let her join me in my room. After consulting with many pediatricians, it was decided that her noisy breathing was due to tracheomalacia – a condition in which the trachea muscles are not fully developed at birth. The doctors decided that it was harmless, and that she would eventually grow out of her noisy breathing. I could write for hours, telling our story to anyone who cares to read it, but this is already a lot. Stay tuned – I will try to update with the home from the hospital post next. This entry was posted in Back Story and tagged birth, c-section, Holy Crap It's a Baby, neonatologist, pregnancy, tracheomalacia, ultrasound, version. Bookmark the permalink.